* This blog is written together with Janez Kren, PhD candidate at the University of Leuven, who is a co-author of one of the studies presented below. Policymakers today have the difficult task of understanding the transformational impact of the data revolution on the economy. As the amount of data traffic keeps rising, data represent a growing part of the global economy. Some estimates show that the contribution of data flows to global GDP is already bigger than the contribution of the flows of goods (Manyika et al., 2016). However, countries increasingly impose new data policies which restrict both the domestic use of data and the flow of data across borders. This trend has resulted in a growing level of restrictiveness in data across many countries (Figure 1) and brings along significant costs both for domestic and foreign businesses and, ultimately, consumers. Source: ECIPE Digital Trade Restrictiveness (DTRI), Ferracane et al. (2018b). The index varies between 0 (completely open) and 1 (virtually restricted) with higher levels indicating increasing levels of data restrictiveness. * The index covers 64 countries around the world representing more than 95 percent of value-added content of gross exports. While the debate on whether data restrictions represent a trade barrier that could potentially be challenged at the WTO is still at its infancy (Burri, 2017; Ferracane, 2017; and Tuthill, 2017), the empirical evidence on the economic impact of restrictive data policies remains scarce, if not non-existent. In this column, we present the results of two recent studies that fill this important gap in the literature. The two studies investigate the impact of restrictive data policies on two economic factors, namely the productivity of local firms and international trade in services (i.e. imports). It does so by specifically looking at whether stricter data policies have a stronger impact on those sectors that rely more heavily on data. 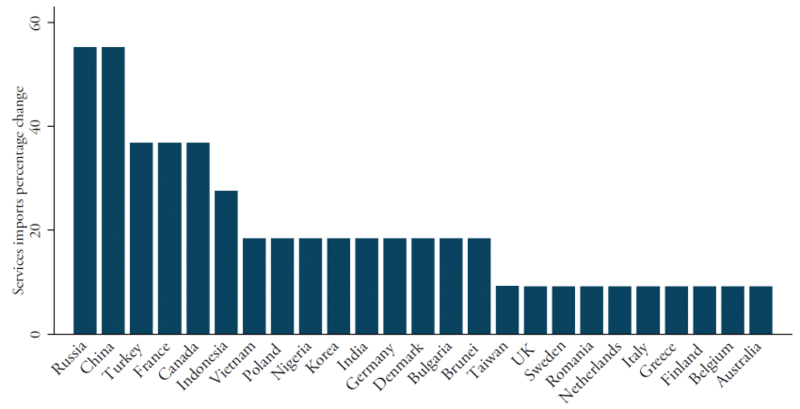 Which countries impose stricter data policies? We define data policies as those regulatory measures that restrict the commercial use of electronic data. We limit our analysis to those measures implemented at the national or supranational level (such as the EU). We identify two main categories of data policies. The first category covers those policies that impact the cross-border transfer of data whilst the second category covers policies that apply to the use of data domestically (see Ferracane et al., 2018b). The former category deals with all measures that raise the cost of conducting business across borders. These measures either mandate companies to keep data within a certain border or impose additional requirements for data to be transferred abroad. More specifically, these measures include bans to transfer data abroad, local processing requirements, local storage requirements, and conditional flow regimes (see Ferracane, 2017). The common feature of these measures is that they create “thick” digital borders between countries. The second category of data policies refers to all measures that impose certain requirements for firms to access, store, process or more generally make any commercial use of data within a certain jurisdiction. These measures apply to both local and foreign firms alike and include data retention requirements, administrative requirements such as the need to prepare a Data Privacy Impact Assessment (DPIA) and to hire a Data Protection Officer (DPO), data breach notifications to government authorities, and the requirement to provide government with direct access to personal data. Based on these definitions, we create an index of data policy restrictiveness for 64 major economies around the globe for the period 2006-2017 (Figure 1). This index is developed by adopting the methodology for the Digital Trade Restrictiveness Index (DTRI) described in Ferracane et al. (2018b) and by using the information from the Digital Trade Estimates (DTE) database. The index ranges from 0 (completely open) to 1 (virtually closed), with higher values indicating stricter data policies. 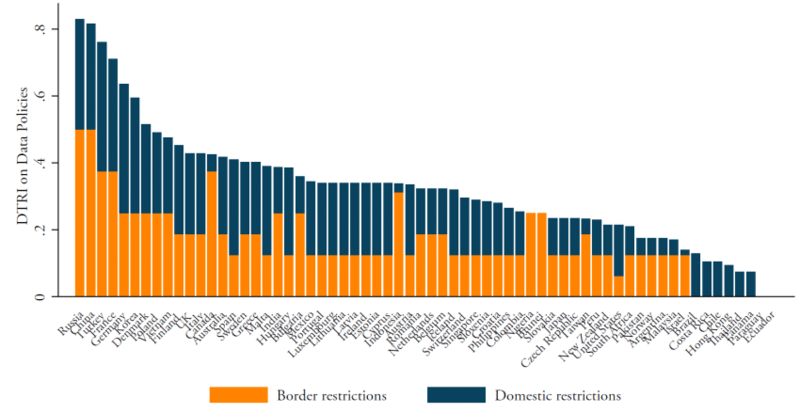 The index shows that Russia, China and Turkey are the most restrictive countries when it comes to the regulatory environment for moving and using data (Figure 2). These countries are followed by two major European economies, France and Germany. Interestingly, all five countries are relatively large, often with a strong manufacturing base compared to their services activities. Source: Ferracane et al. (2018b). In Ferracane and van der Marel (2018), we investigate whether stricter data policies inhibit trade in services. We analyze econometrically whether data policies reduce the imports of services, and in particular of data-intense services, such as computer services, technical services, intellectual property rights and R&D services. We find that restrictions on the cross-border movement of data, as opposed to restrictions on the domestic use of data, significantly reduce imports of services. This is unsurprising, as generally border restrictions have a direct impact on trade. Source: Ferracane and van der Marel (2018). Our analysis predicts that, if countries lifted their restrictions on the cross-border flow of data, the imports of services would rise on average by five percent across all countries, with obvious benefits for local companies and consumers who could access cheaper and better online services from abroad. These numbers amount to a substantial size of foregone gains from trade by putting in place restrictive data policies. To compare, total commercial services exports increased by more than 7 percent in 2017. 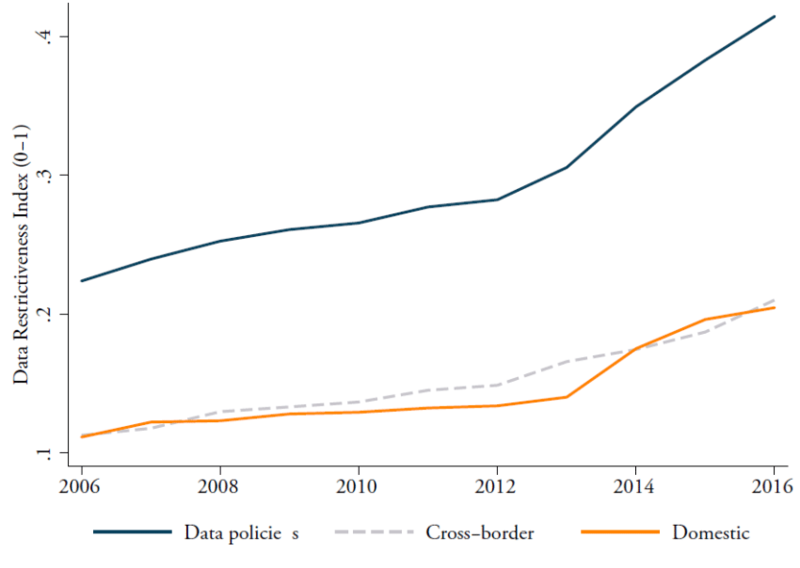 Moreover, if the two most restricted countries, Russia and China, were to remove restrictions on the cross-border movement of data, they would experience a staggering increase of services imports by more than 50 percent (Figure 3). Most of these trade gains would be seen in data-intense sectors such as computer services, financial and insurance services, as well as telecom and R&D services. In Ferracane et al. (2018a) we use a similar empirical approach to investigate whether stricter data policies impact the productivity of local firms in sectors and industries reliant on data. For this econometric exercise, we use advanced productivity measures, such as firm-level and industry-level Total Factor Productivity (TFP), as well as labor productivity. We find that restrictive data policies result in a substantial productivity loss for local companies in industries and services sectors more reliant on data. Both the restrictions on the cross-border movement of data and on the domestic use of data are found to have a negative and significant impact on productivity. Yet we also find that restrictions on the domestic use of data have a marginally stronger impact on productivity compared to policies on the cross-border movement of data. Removing data restrictions would, therefore, have a positive impact on the productivity performance of local firms. On average, we predict that lifting these restrictions would generate a TFP increase of about 4.5 percent across countries (Figure 4), with stronger benefits in data-intensive sectors such as retail and information services. To contextualize the magnitude of this gain in productivity, we can compare the results with Iootty et al. (2016), which explored the potential impact of policy reform in services using a similar approach. The predicted TFP gains that these authors obtained from lowering services restrictions are around 3 percent. The gains from reforming data restrictions are higher and can be explained by the role of ideas as an important factor in today’s economy. Often, ideas are embodied in technologies using data. Source: Ferracane et al. (2018a). Our results show that restrictions that apply to the cross-border movement of data have first and foremost an inhibiting effect on trade in services. Strict cross-border data policies also impact the productivity of local companies and industries, although to a marginally lower extent than policies related to the domestic use of data. These findings can help analyze in what way the two separate categories of data policies impact the economy differently. The fact that policies targeting the international movement of data are the main ones affecting services trade intuitively makes sense as the provision of services across borders often happens by transferring data. Moreover, the digital services exported by many countries rely heavily on data-intense inputs imported from abroad. This is particularly true for the EU (left-hand panel of Figure 5). In the context of global value chains, restricting the flow of data can have a substantial impact on where digital services inputs are sourced from. Policies targeting the use of data, on the other hand, are found to have a comparably larger effect on productivity. This finding also makes intuitive sense. In many countries, the majority of value-added created by data and digital services is primarily employed domestically before being exported indirectly. In other words, most data and data-related services are used as an input in other goods and services at home and only then exported as an embedded item by other sectors (right-hand panel of Figure 5). Source: Authors’ calculations using OECD TiVA. Strict data policies are also likely to affect how services are traded. A recent OECD study (Andrenelli, 2018) found that a range of data-intense services from computer services to retail and information services are increasingly being traded over the internet rather than by other means such as foreign establishments. Restricting data would, therefore, also inhibit companies from choosing the most efficient channel of trading many services. On a wider scale, inhibiting the movement and use of data with restrictive policies is also likely to delay any solution to the widely known “disease” of low productivity in many services today. Early studies (e.g. Baumol, 1967) found that services inherently suffer from low growth in productivity. As services become the dominant part of the economy, they become a drag on the economy. Recent research shows that ICT can contribute greatly to solving this productivity disease (Triplett and Bosworth, 2003). Lifting data restrictions can be particularly important as data is part of ICT. In addition, other studies (e.g. van Ark, 2018) find that ICT technologies and data services still need to be further “infused” in many economies before witnessing large productivity pay-offs. Inhibiting the efficient deployment of data, either domestically or cross-border can, therefore, frustrates prospective economic developments of embedding ICT technologies into the wider economy of many countries. Finally, in the era of cloud computing and data analytics, data restrictions create significant costs when accessing foreign services, and can make it impossible for local firms to use efficient and secure online solutions to build new products and services. In recent years, ICT and the internet have raised the level of productivity of a number of services to that of the manufacturing sector. Restrictive data policies, which in effect can also be seen as a restriction on ICT technology, would slow down the positive contribution that data-intense services have come to play in the entire economy and would hamper prospective gains arising from new innovative technologies (Goldbarb and Trefler, 2018). While it is obvious that certain measures are necessary to protect the privacy of citizens and national security, more research is needed to assess which measures enable countries to best protect these important non-economic policy priorities and which actually create unnecessary costs on the domestic economy and on foreign companies. If anything, the economic impact of policy restrictions on data should be carefully weighed in order to strike the right balance between different important policy priorities, without excessively increasing costs for firms and, eventually, consumers. In this respect, we hope that our results will inform policy makers in the process of weighting social objectives with economic efficiencies when developing and implementing data policies. Although a great number of data policies are applied by local public entities, these are not the policies on which we focus. For a detailed analysis of why these measures constitute a trade restriction, see Ferracane et al. (2018b). Ferracane et al. (2018b) presents the full DTRI. One of the areas covered in the full DTRI are data policies. We base our methodology on this part of the DTRI, but we expand it further to update the data and to create a panel setting for the years 2006-2017. The results are presented in Figure 1. We obtain this conclusion by computing the marginal effects using the coefficient results from Ferracane and van der Marel (2018). A similar methodology is used regarding the productivity effects using coefficient results from Ferracane et al. (2018a). This method is common in the empirical trade literature using econometric techniques. 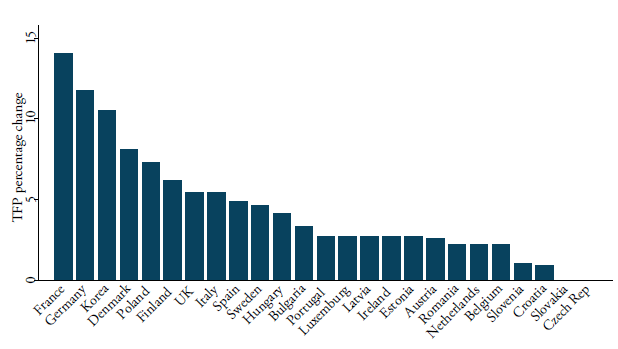 To be more precise, we estimate the average and country-specific increase in imports in case the countries in our study reduced their data restrictions to the average of the three countries with the lowest level of data restrictions. This gives a more realistic approach to policy reform. Of note, in Ferracane et al. (2018a) we analyse productivity effects for 26 developed countries only because the variable for computing firm-level productivity for a wider set of countries is not available. In Ferracane and van der Marel (2018) we analyse the trade in services impact for all 64 countries covered by our data policy index as the services trade data used in the paper allows for a broader scope of countries. The results shown in this policy brief are obtained using our baseline measure for productivity, which is firm-level TFP developed by Ackerberg et al. (2015). Various other firm-level TFP measures common in the literature are also used in Ferracane et al. (2018a) with similar results. TFP is considered the most important factor for long-run GDP growth and it represents the part of economic output accounted for by efficiency and technology. Again, restrictions would be lifted to the average level of data restrictions of the three least restricted countries. Ackerberg, D., K. Caves and G. Frazer (2015) “Identification Properties of Recent Production Function Estimators”, Econometrica, Vol. 83, Issue 6, pages 2411-2451. Andrenelli, A., C. Cadestin, K. de Backer, S. Miroudot, D. Rigo and M. Ye (2018), “Multinational Production and Trade in Services”, OECD Trade Policy Papers, No. 212, OECD Publishing, Paris. Baumol, W.J. (1967) “Macroeconomics of Unbalanced Growth: The Anatomy of Urban Crises.” American Economic Review, Vol. 57, No. 3, pages 415-26. Burri, M. (2017) “The Regulation of Data Flows Through Trade Agreements”, Georgetown Journal of International Law, Vol. 48, No. 1, 2017. Ferracane, M.F., J. Kren and E. van der Marel (2018a) “Do Data Policy Restrictions Impact the Productivity Performance of Firms and Industries?”, ECIPE DTE Working Paper Series No. 1, Brussels: ECIPE. Ferracane, M.F., H.L. Makiyama and E. van der Marel (2018b) “Digital Trade Restrictiveness Index”, European Centre for International Political Economy, Brussels: ECIPE. Ferracane, M.F. and E. van der Marel (2018) “Do Data Flows Restrictions Inhibit Trade in Services?”, ECIPE DTE Working Paper Series No. 2, Brussels: ECIPE. Manyika, J., S. Lund, J. Bughin, J. Woetzel, K. Stamenov and D. Dhringra (2016) “Digital Globalization: The New Era of Global Flows”, McKinsey Global Institute Report, March. Triplett. J.E. and B.P. Bosworth (2003) “Productivity Measurement Issues in Services Industries: Baumol’s Disease Has Been Cured” Economic Policy Review, Vol. 9, No. 3, pages 23-33. Tuthill, L. (2017) “Implications of the GATS for Digital Trade and Digital Trade Barriers in Services”, DigiWorld Economic Journal, 3rd Quarter, Issue 107, pages 95-115.
van Ark, B. (2018) “The Productivity Paradox of the New Digital Economy”, International Productivity Monitor, Centre for the Study of Living Standards, Vol. 31, pages 3-18.